Pop go … the tomatoes! I dropped the tomato seeds into a store-bought sterile seed-starting mix in a variety of recycled yoghurt and cardboard cups: 6 Baxter’s Bush Cherry, 6 Big Beef, 6 Brandywine, 9 Celebrity, 9 Juliet, 8 Red Alert, 9 Sungold, 6 Yellow Plum. I got the seeds from a variety of sources. My two “experiments” for 2010 are Baxter’s Bush Cherry and Red Alert. Both are determinate varieties, which means they’ll have maximum growth of three to four feet and thus won’t turn my garden into a jungle. I found the Baxter’s Bush Cherry on a seed rack in a big-box store, and Totally Tomatoes, a seed company, added Red Alert to my order as a free promotion. Brandywine (Sudduth’s strain) is an heirloom large pink variety dating to the 1880s. It can be temperamental and non-productive in hot, humid weather, but, hey, in hot weather I’m pretty much like that too. Big Beef, of course, is one of a trillion large red “beefsteak” varieties. Celebrity is a big red, one of my all-time favorite slicers. Sungold and Juliet are two of my wife’s favorites. She sews quilts while I sow tomatoes. Yellow Plum is a tradition in my family, and in September I’ll probably be sweating over our stove while cooking up a batch or two of yellow-tomato preserves, just as my great-grandmother used to do. I also planted eight Genovese Basils. Need you ask why? Place a thick, red slice of tomato, say one of those Celebrities, on thin-sliced French bread, top with a slice of mozzarella and a couple of just-picked basil leaves, drizzle with extra-virgin olive oil—oh, I’m salivating at the mere thought. On Day 1, April 25, I planted the seeds and moved the four trays to a seed-starting rack in our utility room, right next to our furnace, where the temperature is about 72° F. Day 2: I didn’t peek. Day 3: I still wasn’t tempted. Day 4: I was starting to wonder. Day 5: I looked and found nada, but I set the timer (14 hours) and tested the cool-white fluorescent shop lights that hang just a few inches above the cups. Day 6: Pop—the Sungolds emerged. Day 7: Pop, pop, pop, pop, pop—Big Beefs, Celebrities, Juliets, Brandywines (see photo), and Red Alerts started reaching for light. Day 8: Pop—Yellow Plums. Day 9: Pop, pop—Baxter’s Bush Cherries and the basil. I’ll have to check them every morning and evening now—to water them when needed. In about a week I’ll thin the young plants by using scissors to snip off all but one plant in each cup. Cruel, cruel, Bob. Will I plant 62 tomato plants? No. I don’t have room this year for more than about 20, but friends won’t be shy about volunteering to take the extras. In future postings I’ll add more chapters to “Growing Great Tomatoes 2010.” Shouldn’t you consider growing tomatoes from seed next spring? I admire your patience waiting till April to sow the seeds. I know the plants will catch up quickly when planted out in the warmth, but I have to hold myself back just to wait until mid-March! I second the motion!!!!! What agony to hold off on planting seeds. My poor little cukes got freeze-dried in the wind and cold over the weekend. But I just had to try and get a jump on the season and have been chastized accordingly. I am growing Amy Goldman's Italian American and Lumpy tomatoes this year. 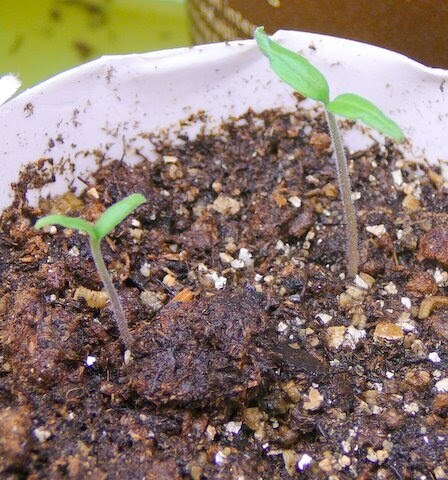 A neighbor bought a flat of tomato seedlings — she has 2 raised beds — what was SHE thinking? So I now also have a couple each of early girls and sweet millions.